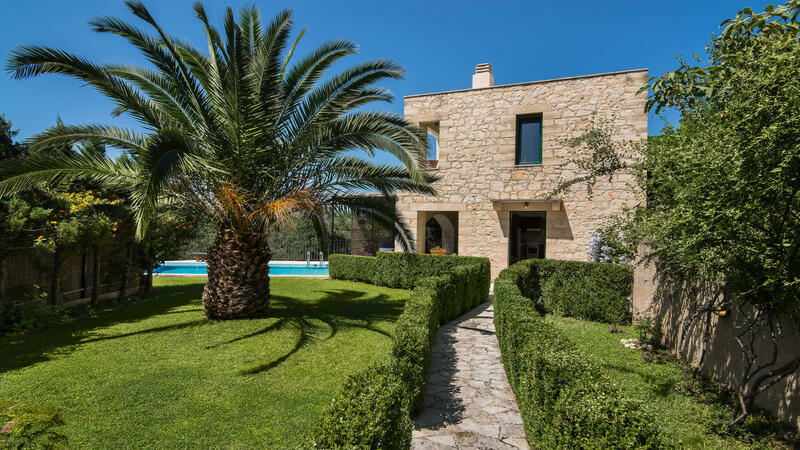 In a green environment with unobstructed views of the beautiful Cretan hinterland, Villa Maria is located in an area of ​​350sqm. It covers an area of ​​117 sqm divided into two floors. On the ground floor there is a living room with fireplace, a fully equipped modern kitchen, a dining room and a WC. The second floor includes a 14sqm double bed bedroom, a 13sqm two single beds bedroom and a large bathroom with a bathtub and shower. Villa Maria is designed to host families, couples or a group of friends, no more than 5 people. Once you have settled in, we will be on hand to share with you information about shops, restaurants, museums, gorges, beaches, local feasts, or anything else you may need. On arrival you will find a complimentary basic pack with feta cheese, vegetables, sugar, spices, fruit, mineral water, milk, orange juice, crisps, biscuits and cooking olive oil. If you would like to create your own pack with added items, please contact us with your requirements and we will provide you with a price. Our maid will be cleaning the villa on arrival day and midweek, for those staying for 7 nights. For longer stays, cleaning is offered twice weekly. Rates include maid service and linen change twice weekly, electricity, water, air-condition, full maintenance service and all taxes and VAT. Early check-in or late check-out upon request and subject to availability! Contact us in order to send you our bank details. We had a truly wonderful stay at the villa, everything we needed and nothing was too much trouble for Manos and his family. We had treats given to us by Manos’s Mum and Dad and they were great. The villa is well kept to a high standard and the view was spectacular. You do need a car to get to and from and we had many a day out sightseeing. The village itself is truly unspoilt and we had a drink in the village bar which was fun. All in all we cannot find fault with anything in Crete and if you are looking for a relaxing unspoilt holiday then stay at Querini Villa’s you will not be disappointed. Thank you Manos for everything in making our stay so memorable. The venue is state of the art, clean, beautiful and with an excellent Mediterranean character. We loved the pool! The location is very convenient. Peaceful, offers privacy and is only 15-30 minutes drive from beautiful beaches and major attractions of the western Crete. The overall experience was sound. I will definitely repeat the visit next year. Wow!! What a find. We spent 2 weeks here & couldn’t have asked for more; stunning views, peaceful location & wonderful weather. Manolis was a lovely host & made sure we had everything we needed & more – the extra treats were delicious & enjoyed by all the family – thank you! The location is ideal, whether you want to spend a relaxing day by the pool or explore what this beautiful island has to offer, you won’t be disappointed. We all had a great time & plan to return to Crete & Querini Villas again next year.